Ihimaera, W. (2003). The Whale Rider. New York, NY: Harcourt Books. The Whale Rider is set in Whangara (on the East Coast) of New Zealand, where Paikea is the founding ancestor. The main story, the native people, and events described are well detailed and believable in this realistic fiction/fantasy. This story is about a Maori family with cultural rituals. As the story begins, Porourangi, the eldest of the two has a daughter, inflaming his grandfather because the birth of a daughter breaks the lineage. The history of a Maori tribe and its ancestry are interwoven with stories of Kahu, who will prove to be the tribe’s future and the whales, who are also a part of the tribes past. It is a novel about destiny and how the answers we seek often come in different (and unexpectedly better) forms than what we expected. The Whale Rider tells a traditional Maori legend about Paikea and his arrival in New Zealand. It explains how this man arrived here and prepared for his tribe to come. The story then goes into depth about how Kahu, the great-great-great-great-great-grandaughter of Paikea must become the leader of their tribe. Eight-year-old and free spirited Kahu, a member of the Maori tribe of Whangara, New Zealand, fights to prove her love, her leadership, and her destiny. Her people claim descent from Kahutia Te Rangi, the legendary “whale rider.” In every generation since Kahutia, a male heir has inherited the title of chief. But now there is no male heir, and the aging chief (Kono) is desperate to find a successor. Kahu is his only great-grandchild, and Maori tradition has no use for a girl. But when hundreds of whales beach themselves and threaten the future of the Maori tribe, it is Kahu who saves the tribe when she reveals that she has the whale rider’s ancient gift of communicating with whales and even rides the Legendary Bull Whale out to sea to save it because she is the chosen one. This book alternates between ancient mythology and the modern struggle of a young girl trying to take her place in society. The mythology portions tell the story of the whale rider, who was a long-ago ancestor who rode a giant ancient whale to the land where the Maori tribe of Whangara, New Zealand live. Parts about the mythology and the internal narrative of the giant whale are compelling passages, and how Kahu’s persistent love and optimism continues to shine brightly regardless of how the chief reacts which actually amplifies her strong, brave, and leadership characteristics. 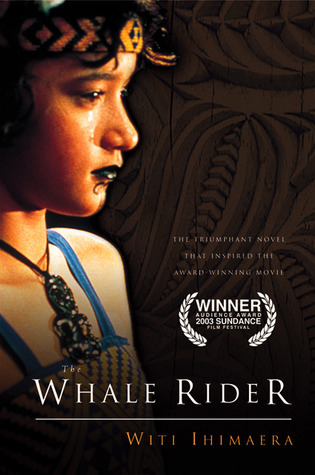 The Whale Rider is a story about Kahu and her family’s struggle to bring back balance to their Maori tribe in Whangara. As it is a story set in New Zealand and is about a Maori tribe, a lot of the words used in the book are in the Maori language, and may be a little hard to follow along if you don’t refer to the glossary of terms at the end of the novel. The Whale Rider is a journey of love and destiny. Through the story of the Maori people of New Zealand and their heritage/customs, readers will be introduced to new a new culturally diverse group of people. The book is enjoyable and the reader will undoubtedly have tears as well as laugher through the pages of the story. This story is good for introducing readers interested in Maori legend. The Whale Rider also introduces the reader to their folk stories and beliefs about their origins, and even native language which can be translated or further studies form the glossary at the end of the novel. This book is a quick read, and highly recommended for anyone that loves reading culturally diverse tween literature such as Esperansa Rising by Pam Munoz Ryan. The Whale Rider is a novel-turned-movie about a young girl, Kahu, desperately trying to prove her worth to her grandfather, Paka, and her people. The movie Whale Rider (2002) follows the book closely enough and is the winner of the 2002 People’s Choice Award and the Toronto Film Festival.